Elegance, beauty and unique are some of the words that spring to mind when you see this piece. Attention to detail was the number one goal with this project, all hardware, materials and finish are top of the range. This sideboard/credenza has two cabinets and three drawers, all push release and the doors have a piston system built in to give an easy down slow movement when the door opens. Inside is a bar section with a built in wine glass holder. The drawers have a wine rack system that is removable if preferred. Finished with a high durability clear lacquer. The front has a white wash stain applied, then coated with the same high durability lacquer. There are Walnut splines on the two corners of the unit and also on all corners of the drawer boxes, attention to detail is key. Unit comes with Walnut serving tray 13" in diameter, 1 " thick. 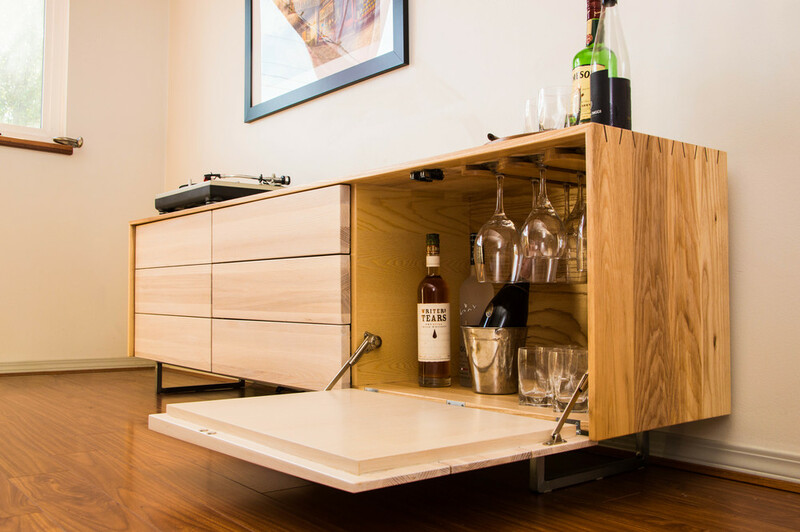 Drawers can hold 6 bottles of wine or liquor per drawer. Lacquered steel base to give a rigid platform for the Eloquent Barman.